The Host is a 2013 American romantic science fiction thriller film adapted from Stephenie Meyer's 2008 novel of the same name. It tells the story of a young woman, Melanie, who is captured after the human race has been taken over by parasitic aliens called "Souls". After Melanie is infused with a soul called "Wanderer", Melanie and the alien "Soul" vie for control of her body. Written and directed by Andrew Niccol, the film stars Saoirse Ronan, Max Irons, Jake Abel, William Hurt, and Diane Kruger. Released in theaters on March 29, 2013, the film was poorly received by critics. The human race has been taken over by small parasitic aliens called "Souls". They travel to planets inserting themselves into a host body of that planet's dominant species while suppressing the host's consciousness. They access the host's memories, and occupied hosts are identifiable by silver rings in the hosts' eyes. A human on the run, Melanie Stryder, is captured and infused with a Soul called "Wanderer." Wanderer is asked by a “Seeker” Soul to access Melanie's memories and learn the location of a pocket of unassimilated humans. Melanie's consciousness, however, has not been completely eliminated; she and Wanderer carry out an internal conversation and debate with each other, forming a friendship. Wanderer tells Seeker that Melanie was traveling with her brother, Jamie, and her boyfriend, Jared Howe, to find Melanie's uncle Jeb in the desert. Wanderer admits that Melanie is still present, so Seeker decides to be transferred into Melanie's body to get the information herself. With Melanie’s guidance, Wanderer escapes and makes her way to the desert, where she is found by Jeb, who takes her to a series of caves inside a mountain where the humans (including Jared and Jamie) are hiding. Wanderer's presence is met with hostility by all but Jeb and Jamie. Melanie instructs Wanderer not to tell anyone she is still alive, since it would provoke them, though she later allows her to tell Jamie. Wanderer begins interacting with the humans and slowly begins to gain their trust, forming a bond with Ian O'Shea. Seeker leads a search party into the desert. They intercept one of the shelter's supply teams, and in the ensuing chase, Aaron and Brandt commit suicide to avoid capture. During the chase, Seeker accidentally kills another Soul, leading her superiors to call off the search. Jared and Kyle move to kill Wanderer, causing Jamie to reveal that Melanie's consciousness is alive. Jeb and Ian accept this, but Jared refuses to believe it until he strategically kisses Wanderer, provoking Melanie to take back control and slap him, proving to Jared that she is still alive. Kyle tries to kill Wanderer but endangers his own life and ends up being saved by Wanderer. Ian believes that Kyle attacked Wanderer and tells her he has feelings for her. Wanderer admits that Melanie's body is compelled to love Jared, but she has feelings of her own, and the two kiss. Wanderer enters the community's medical facility and discovers that Doc has been experimenting with ways to remove Souls and allow the host's mind to regain control, resulting in the deaths of many Souls and hosts. After isolating herself for several days, Wanderer learns that Jamie is critically ill with an infection in his leg. She infiltrates a Soul medical facility to steal some alien medicine, saving Jamie's life. Seeker has continued looking for Wanderer on her own, but Jeb captures her. Wanderer offers to show Doc the proper method of removing Souls, on the condition that he later remove her from Melanie's body. Doc uses the technique to remove Seeker from her host, with both host and Soul surviving. Wanderer takes Seeker’s tiny alien form to a Soul space-travel site, where she sends it so far from Earth that it can not return for numerous generations. Tired of the many lives she’s lived and finding it too painful to leave everyone behind, Wanderer makes Doc promise to let her die when she is removed and not tell anyone. The others in the shelter intervene with Doc, who inserts Wanderer into Pet, a human who was left brain-dead after the Soul inside her was removed. Now with a body of her own, Wanderer is able to be with Ian, while Melanie reunites with Jared. A few months later, while on a supply run, Wanderer, Melanie, Ian and Jared are captured. They discover that their captors are humans, who reveal that there are several other human groups as well. They also learn that a Soul with this group has sided with the human resistance, as Wanderer has, and they may not be the last Souls to do so. 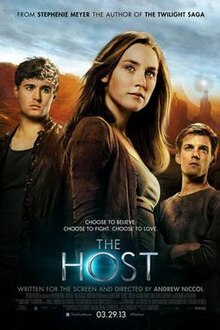 Producers Nick Wechsler, Steve Schwartz, and Paula Mae Schwartz acquired the film rights to The Host in September 2009, but Open Road Films later acquired the film rights, and made Stephenie Meyer, Nick Wechsler, Steve Schwartz, and Paula Mae Schwartz the main producers. Andrew Niccol was hired to write the screenplay and to direct the film. In February 2011, Susanna White was hired to replace Niccol as director, but he later resumed the role in May 2011. Saoirse Ronan was also cast in May as Melanie Stryder/Wanderer. On June 27, the release date was set for the film for March 29, 2013, and it was also announced that principal photography would begin in February 2012, in Louisiana and New Mexico. Distributed by Open Road Films, the film was released theatrically on March 29, 2013. The first official trailer was released on March 22, 2012, and was later shown before The Hunger Games. The Host was released on DVD and Blu-ray on July 9, 2013. The film grossed $63,327,201 worldwide, of which $26,627,201 was from North America, and $36,700,000 from other territories. It opened at #6 at the US box office, and for its opening weekend grossed $10,600,112; screened at 3,202 theaters it averaged $3,310 per theater. The film was widely panned by critics. On review aggregation website Rotten Tomatoes the film has an approval rating of 9% based on 124 reviews, with an average rating of 3.6/10. The site's consensus states, "Poorly scripted and dramatically ineffective, The Host is mostly stale and tedious, with moments of unintentional hilarity." On Metacritic, which assigns a normalized rating based on reviews, the film has a score of 35 out of 100, based on 28 critics, indicating "generally unfavorable reviews". On CinemaScore polls, audiences gave the film a grade of "B−" on a scale of A+ to F.
Manohla Dargis of The New York Times gave the film an unfavorable review, calling it "a brazen combination of unoriginal science-fiction themes, young-adult pandering and bottom-line calculation". Todd McCarthy of The Hollywood Reporter felt that "it's cloaked in yawningly familiar teen-romance terms and cries out for even a little seasoning of wit, irreverence, political smarts and genre twists that, given the well-trod terrain, seem like requisites when presenting visions of the near future." Roth Cornet of IGN gave it a "mediocre" score of 5/10, stating that the film is "unintentionally laughable" and "frustratingly absurd". Cornet says that it could have made an interesting story but that the contradictions of the peaceful but parasitic Souls were not fully explained, in the case of the character Seeker only given a shallow unsatisfying explanation. She praises Ronan for her performance and blames a "fundamentally flawed" script. Ben Kenigsberg of Time Out magazine blames the source material, crediting Niccol for making the best of it, but primarily blaming the high-definition–video cinematography saying it makes "what once would have been a lush, grand-scale blockbuster appear cheap and televisual." The Host was the penultimate film to be reviewed by film critic Roger Ebert before his death on April 4, 2013, and the last major film to be published in his lifetime. He rated the film 2.5/4 stars, saying "The Host is top-heavy with profound, sonorous conversations, all tending to sound like farewells. The movie is so consistently pitched at the same note, indeed, that the structure robs it of possibilities for dramatic tension." Saoirse Ronan was nominated for a Teen Choice Award for her performance in The Host, under the category "Choice Movie Actress: Sci-fi/Fantasy", but lost to Kristen Stewart for her performance in The Twilight Saga: Breaking Dawn – Part 2. ^ "THE HOST (12A)". British Board of Film Classification. March 20, 2013. Retrieved March 20, 2013. ^ a b c d "The Host (2013)". Box Office Mojo. Retrieved May 13, 2013. ^ Schutte, Lauren. "Andrew Niccol to Direct 'The Host'". Retrieved January 22, 2012. ^ Staskiewicz, Keith (May 3, 2011). "Saoirse Ronan cast in film of Stephenie Meyer's 'The Host'". Retrieved May 26, 2018. ^ a b Bentley, Jean (November 10, 2011). "Max Irons, Jake Abel land male leads in Stephenie Meyer's 'The Host'". Zap2It. Retrieved May 26, 2018. ^ a b Meyer, Stephenie. "The Host: The Movie". Retrieved February 16, 2012. ^ a b Sneider, Jeff (January 21, 2012). "Canterbury, Holbrook land 'Host'". Variety. Retrieved May 26, 2018. ^ Fleming, Mike (January 20, 2012). "Diane Kruger To Play The Seeker In Stephenie Meyer's 'The Host'". Deadline Hollywood. Retrieved May 26, 2018. ^ Sarah. "Review: Stephenie Meyer's 'The Host'". thehostmovienews.com. Retrieved December 26, 2012. ^ Wilkinson, Amy (April 1, 2013). "Let's Talk About That 'The Host' Cameo". MTV News. Retrieved May 26, 2018. ^ McClintock, Pamela. "'The Host' to be Released by Open Road Films in March 2013". Retrieved January 22, 2012. ^ Wilkinson, Amy. "'The Host' Lands Release Date: Here's What We Know About Stephenie Meyer Adaptation". Retrieved January 22, 2012. ^ The Host official trailer on YouTube. Retrieved April 12, 2012. ^ "The Host (2013) DVD". ^ "The Host (2013)". Rotten Tomatoes. Flixster. Retrieved January 4, 2019. ^ "The Host". Metacritic. CBS Interactive. Retrieved October 16, 2013. ^ Brad Brevet (March 31, 2013). "G.I. Joe: Retaliation' Tops Weekend Box Office While 'The Host' Flops". Ropeofsilicon.com. ^ Dargis, Manohla (March 28, 2013). "Fighting the Peacenik Alien Within Her - Saoirse Ronan in 'The Host,' From a Stephenie Meyer Novel". The New York Times. ^ McCarthy, Todd (March 28, 2013). "The Host: Film Review". The Hollywood Reporter. ^ Roth Cornet (February 14, 2013). "IGN The Host Review". IGN. Retrieved March 31, 2013. ^ Ben Kenigsberg. "The Host: movie review (PG-13)". Time out. ^ Ebert, Roger (March 27, 2013). "The Host". Chicago Sun-Times. Retrieved April 7, 2013. ^ "Teen Choice Awards Nominees Announced!". The Huffington Post. May 22, 2013. Retrieved July 17, 2016.